A little iron table covered with a red cloth, with the chairs facing the sea, on the cobbled pavement from the top of the cliff. A glass of cold and crisp Chardonnay. The sunset. A man with a guitar singing Caruso. Thousands of tiny lights turning on one by one while the darkness took over the skirts of the Vesuvius volcano. 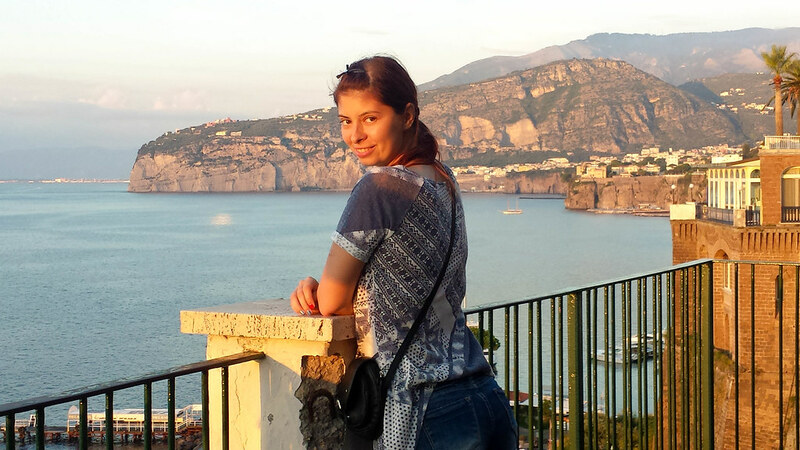 This was the moment I fell in love with Sorrento! 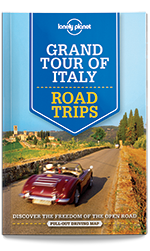 This stylish city is a perfect destination if you are looking for luxury homes in Italy for an unforgettable holiday. 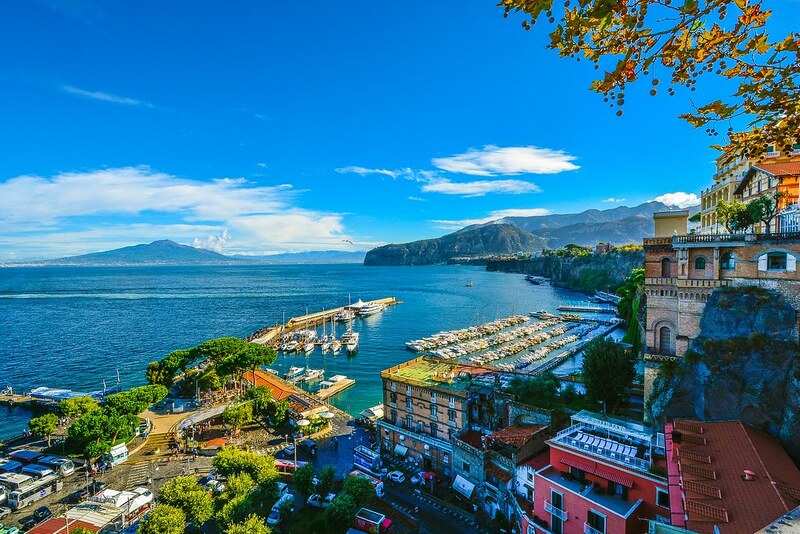 With stunning views over the bay of Napoli and the Vesuvius, narrow cobbled alleys and heaps of lemon trees, Sorrento is like a summer dream bound to make you happy. But what makes Sorrento so special? Sorrento has been built on the high cliffs overlooking the bay, which separate it from the luxurious marina and the cruisers terminal. In the Greek mythology, this was the home of the sirens who would lure the sailors into the rocks, with their enchanting songs. Imagine spending your holiday in a villa on top of the cliffs with panoramic views over the beautiful bay. Imagine having a glass of wine in the evening, watching the sunset, listening to the light breeze and sharing a kiss with your loved one. Imagine walking inside the maze of narrow, cobbled streets of the old centre, discovering hidden local trattorias and gelaterias. 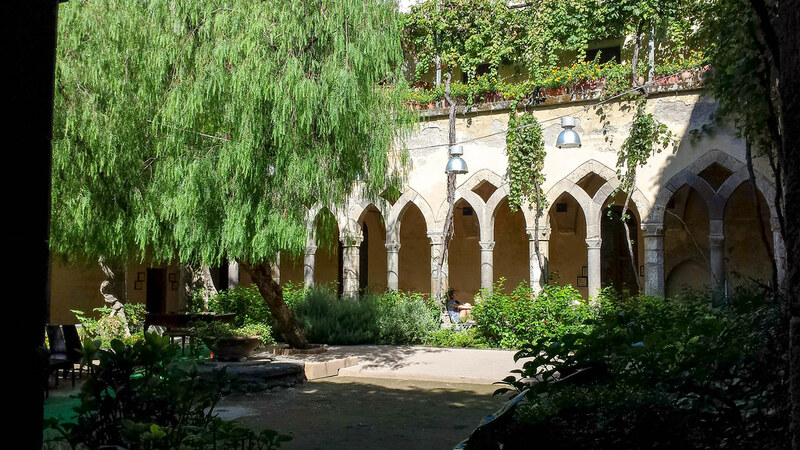 And when you don’t expect it, bump into a beautiful church with a peaceful green courtyard where you can step away from the tourists and just enjoy a moment of bliss and quietness. Imagine you are living la dolce vita, even if it’s just a holiday, as this is one of the best things to do on the Amalfi Coast. Italian food is one of the best in my opinion but the one on the Amalfi coast surprises through the freshness of the ingredients and the simplicity of the cooking which together create mouth-watering flavours. 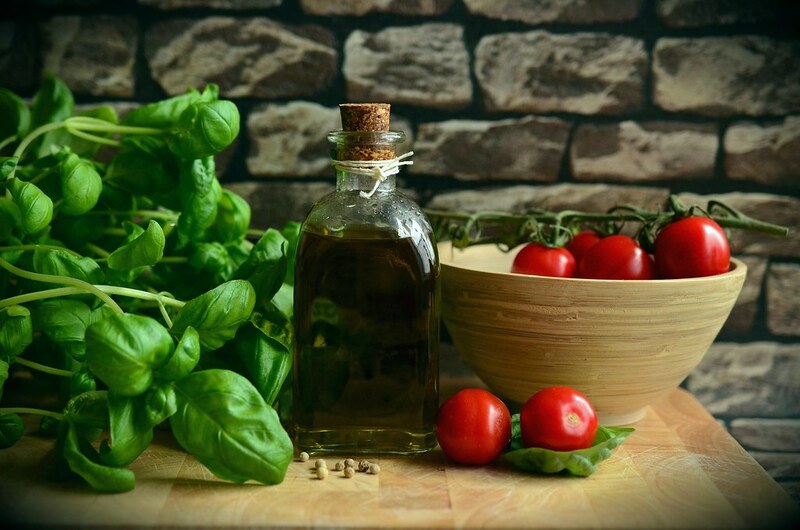 The main ingredients used in the cuisine in Campania are the olive oil, fresh herbs, ripe vegetables and fresh pasta. In fact, pizza was invented in this Italian county, in Napoli! You can’t say Sorrento and not think of the limoncello made from the giant fragrant lemons growing all over the rocky slopes nearby. The Sorrento lemons are large with a thick peel, have an elliptical shape and a vibrant yellow colour. They are juicy, almost seedless and have the richest amount of Vitamin C out of all the world’s lemons. 60% of the lemons produced on the Amalfi Coast are used to produce limoncello, a digestive liquor with a distinctive fresh taste. As the locals say, limoncello tastes like a kiss from the sun. It is served chilled, usually after meals and it’s sipped, not drank as a shot. 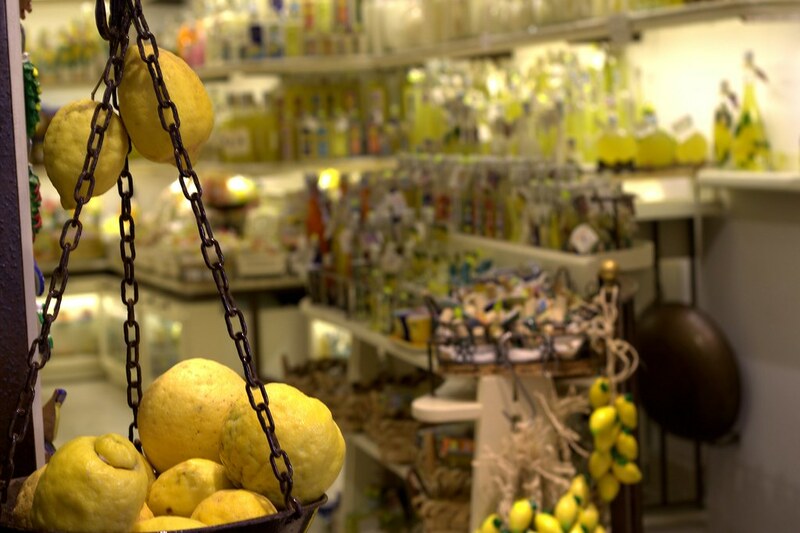 Many little shops in Sorrento produce their own limoncello using their family recipes, so no two will taste the same. You can also try the crema di limoncello which is a sweet cream liquor, sweeter than the original version. Don’t miss the baba al limoncello, a unique dessert developed by I Giardini di Cataldo, an estate growing lemons and walnut, producing artisanal yummy treats out of them. I have actually passed by and tried their lemon gelato which was divine. The baba is a traditional napoletan dessert soaked in rum for 48 hours. The baba al limoncello produced by I Giardini di Cataldo is soaked in limoncello instead of rum. If you can’t wait until your trip you can even order it online, on their website. While meat consumption tends to be low in Campania, the cuisine relies on fish and seafood, and you can expect it to be fresh and very high quality. The fish is usually curated in salt and then baked with tomatoes, olives and pine nuts, creating a delicious dish called baccala alla napoletana. You can find seafood and fish in everything, from starters to soups, pasta and stews. You can enjoy dishes like zuppa di cozze (steamed mussels in their own juice with white wine and parsley), polpo affogato (octopus sautéed with tomatoes and hot peppers), spaghetti con vongole (clams spaghetti with olive oil and garlic) or fritto misto di mare (an assortment of fried calamari, shrimp and anchovies served with fresh peaches and white wine). You might ask yourself why tomatoes? Well, the mild climate and the rich volcanic soils contribute to the juicy and flavour of the Campanian tomato, making it a delicious treat. The best way to taste the tomatoes in Sorrento is by ordering a Caprese salad. The Insalata Caprese from Sorrento is different from anywhere else in Italy because instead of mozzarella di buffala (buffalo cheese) it is used fior di latte (cow’s milk mozzarella) because back in the 1950s, when this salad was invented, there were no buffaloes on the island of Capri. The Caprese is served with a few leaves of wild arugula and a pinch of dried oregano. The seasoning is simple, just extra-virgin olive oil. Campania is not a very rich area of Italy and this is why their cuisine is simple, based on the vegetables grown in the countryside. Some of the traditional dishes include parmigiana di melanzane, gnocchi alla Sorrentina, peperoni imbottiti or cianfotta. 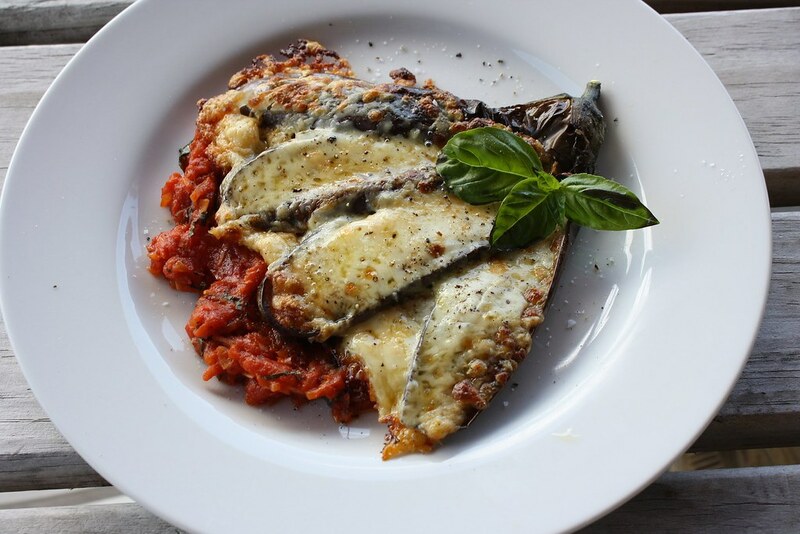 Parmigiana di melanzane is a delicious comforting dish where sliced of aubergines are fried, then layered with fresh tomatoes, mozzarella and basil, and baked in the oven. It is one of the most famous dishes in the area. Gnocci alla Sorrentina is another dish that boosts in flavour due to the tomatoes used in the sauce. It’s a simple recipe, with the potato pasta topped with the tomato sauce and then covered in Treccia cheese and garnished with some fresh basil. It’s all about flavours! Peperoni imbottiti are stuffed peppers with aubergines, breadcrumbs, black olives, capers, anchovies and garlic. Cianfotta is a summer vegetable stew with eggplant, zucchini, peppers, onions, tomatoes, garlic and basil, a perfect treat for vegetarians. It is usually served with pasta, rice or polenta. Da Ciccio Cielo Mare E Terra – a family five stars restaurant with breath-taking views over the Amalfi Coast serving traditional Italian dishes. Eolo – a fine dining experience with the menu based on fish and seafood, prepared using only local ingredients to enhance the flavours. Sorrento doesn’t have its own beach, so if you want to sunbathe on sand you have to go to the nearby towns of Sant’Agnello or Marina di Puolo. 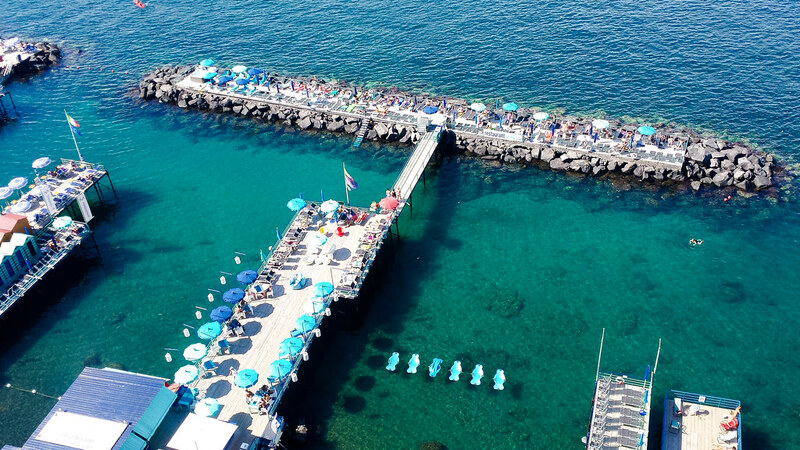 If you do want to stay in Sorrento though, you can sunbathe on the piers alongside the waterfront owned by the hotels and restaurants in the area. To enter such a beach club you will have to pay around 15 euros but you will get a lounger and an umbrella for the day included as well. The water underneath the piers is crystal clear, with a shade of emerald green. To access the beach clubs you will have to either walk down the cliffs on a steep path or take the elevator for a 1 euro fee. If you decide to adventure towards the sandy beaches, the nearest one and the easiest to get to is Sant’Agnello. Just hop on the train for a couple of minutes and then follow the directions towards the waterfront. The beach is small but beautiful, surrounded by high cliffs. Here again you have the option to walk down and take the elevator. This seems to be a local beach, with very few tourists around. If you get hungry there is a tiny shop on the promenade which makes fresh paninis but there is also a family run limoncello distillery where you can sample and buy the Sorrentino liquor. To reach Marina di Puolo you can either driver or take the local bus. It you opt for the latter option, once you get off the bus you will have to walk down a steep road, surrounded by olive trees. The beach is sandy and there are plenty of cafés and restaurants along it. In Sorrento, the majority of the shops stay open until 10PM, so if you want to spend your day sunbathing or sightseeing, there is plenty of time left for shopping as well. Take a stroll on Corso Italia, the main road in town and search for the local workshops making lace, leather or wood carvings. Actually, the town is famous for its inlaid wood carvings which are called intarsia. 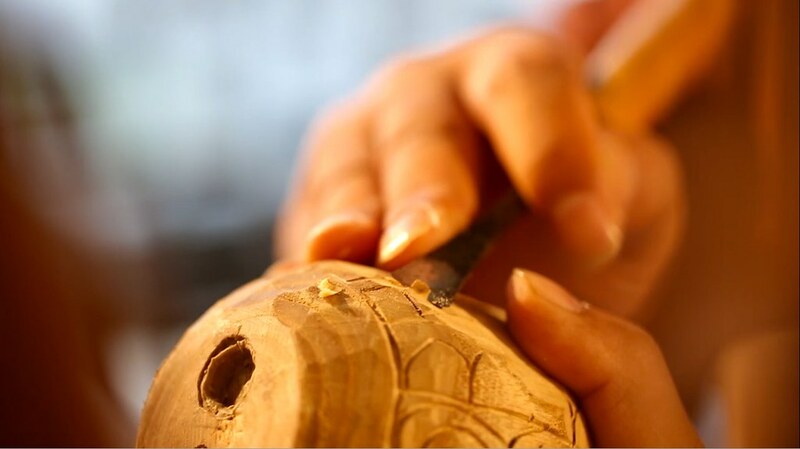 Head over to the artisan neighbourhood and visit the Museobottega della Tarsialignea to find out more about this local craft. The museum is a work of art itself, situated in an 18th century palazzo. 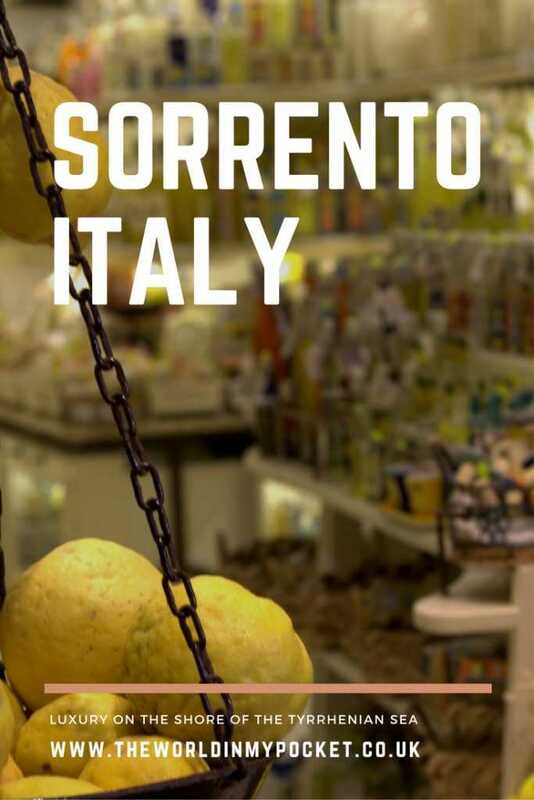 Treat yourself with a bottle of limoncello and a few fresh lemons or with some unconventional pasta from the Fattoria Terranova farm shop (where you can also take a cooking class to learn more about Sorrento’s flavours, just ask inside the shop about it). ← Cabin Zero – A travel bag that fits all airlines! Oh my goodness what an absolutely stunning place, I am loving that view, I would most definitely LOVE to visit myself. Sorrento sounds amazing and so pretty.I love the views and the scenery. I would love to visit especially as the food sounds amazing too. What a beautiful looking place, I would absolutely love to visit Sorrento. Italy is such a gorgeous, feel-good country isn’t it? Wow, these views are picture postcard beautiful. I definitely want to go here some day. What a stunning place with gorgeous views. I’d definitely love to visit. Looks absolutely gorgeous. I’d love to visit Sorrento. The food looks especially tempting. Wow, Sorrento looks absolutely breathtaking. Looks like there is absolutely delicious food to be had there too! this is absolutely stunning. I would love to visit there one day. youve completely sold it to me! Sorrento has been on my bucket list for a while and wow, now I really need to make plans to go! That seafood sounds incredible! Sorento sounds an amazing place to visit. The views are just stunning and the food all sounds heavenly. 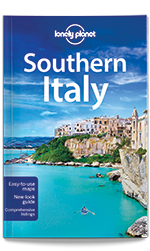 We’re planning to visit Italy next year and tour around different areas so I’m going to have to add Sorento to the list now! That sounds like an amazing place to visit to especially the view and the food, it looks delish. 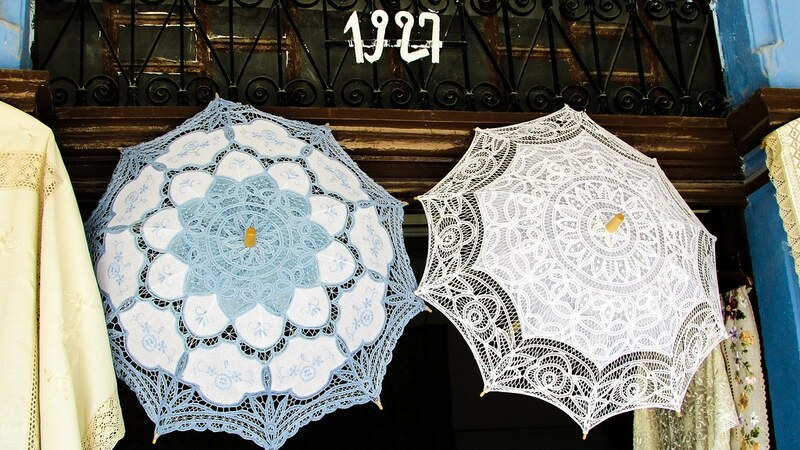 Love the intricate design on the umbrella too. Whoa, what a stunning looking place. Everything looks so colourful and I won’t even start on tose clear blue skies! Beautiful photos too! I LOVE Sorrento. It’s one of my favourite places in Italy. We drove along the Amalfi coast from Naples and stopped at Sorrento.The view was stunning. I love the cobbled streets and the Limoncello of course. Such a detailed description of Sorrento that makes me want to go there! I love limoncella and the food sounds amazing. There is nothing like the tomatos from this part of the world and I love aubergine dishes. Its a shame there isnt a beach right there but at least there are some nearby. I heard about this city before, but never knew that itis home sirens from the Greek mythology. I think I would enjoy the mystic energy of romantic Sorrento. Sorrento sounds very much amazing and from the pictures it looks like one of the finest shore. We wish if we can explore Sorrento right now. The place is full of enthuse. Oh my gosh your pictures have given me a serious dose of wanderlust! The lobster looks insanely yummy! Take me there now! Sounds like heaven right now! Although I’m not sure I want to pay 15 euros to sunbathe! 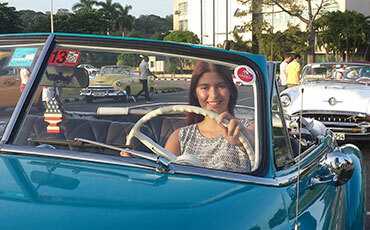 Well, I am always in love with travelling and anything about that makes me go berserk! The pictures look great and you have provided each and everything a person should do if he/she visits the place! Thanks for the post! OMG Sorrento looks like a dream. We’re off on holidays in a few weeks and we’re already planning our next one lol! 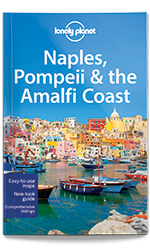 We were thinking Amalfi actually! I’d probably bring back more limoncello than I’m allowed. Wow! Sorrento looks awesome. I love Italy but I missed this part of the country. You have shared such beautiful pics. Aubergines and zucchini looks dee-licious! Looks so beautiful! 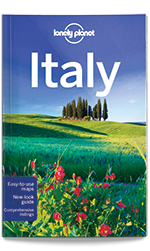 Planning on going to Italy in the near future and definitely adding Sorrento to my list of places to visit. Oh my! This is such a beautiful place to visit. Everything looks so wonderful. How i wish i can go here someday. This looks like a great place to visit. I really like the view overlooking on the bay. and the food looks so tasty and tempting. Yummy!! This trip of yours. Sure do look a luxurious one. I sometimes wish to be a travel blogger and travelling will be my work. People holidays will be my work. What a thought! Those seafood and aubergines look to die for! Sorrento has been on my list for a really long time and now you’ve made it higher on it! We were in Sorrento in 2015. I remember those perfect views of Napoli Bay and Vesuvius. I remember the lemons and even had my first taste of limoncello there! But, oh, how I wish I found those umbrellas because I would have bought one! First of all… your puictures are stunning! Second of all…. 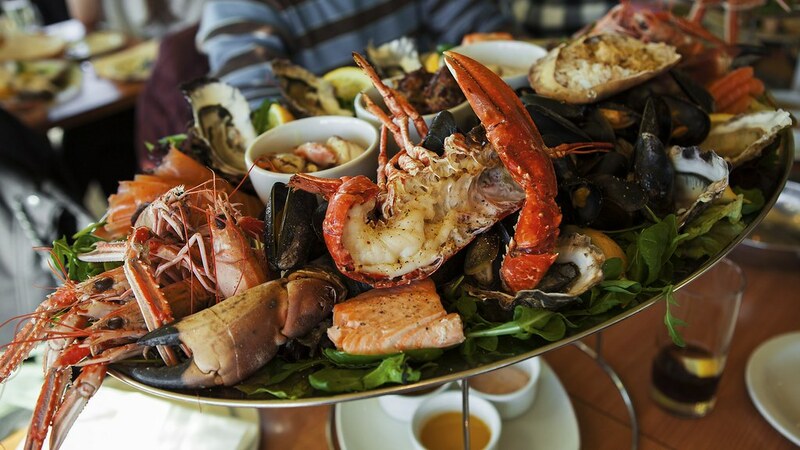 The seafood look to die for! last but not least… the views are breath taking! Your writing is amazing! If you ever write a book I’dread it. I love those clifftop views, they’re beautiful. You got a wonderful shot here. I also want to try those delicacies, which is your favorite? How long did you stay in the place. You’ve made Sorrento looks as amazing as it sounds. I love your photos too. It seems like a magical place and the food sounds beyond amazing. Gosh that picture of the view, with literally everything blue is breathtaking!! Italy is so beautiful and with the food choices you, Sorrento is a delightful place. I don’t eat fish/sea food, so I would love to try Caprese salad and of course Zucchini..one can’t miss that while in Italy 😉 Loved those little umbrellas!! I haven’t been to Sorrento but it looks like a delightful place. Would love to try Baba na Limoncelli one day. That just sounds way too delicious. Shopping till 10 Pm. That is something I would love. Sorrento looks like a picturesque location, staying in those villas on top of the cliffs with views over the bay must be an incredible experience. We knew Pizza was invented in Naples but hadn’t heard about the limoncello we would love to try it and the other desserts too. We love lace and wood carvings so some of those are definitely gonna make great souvenirs for us to take back home. Stunning photos. Well done. 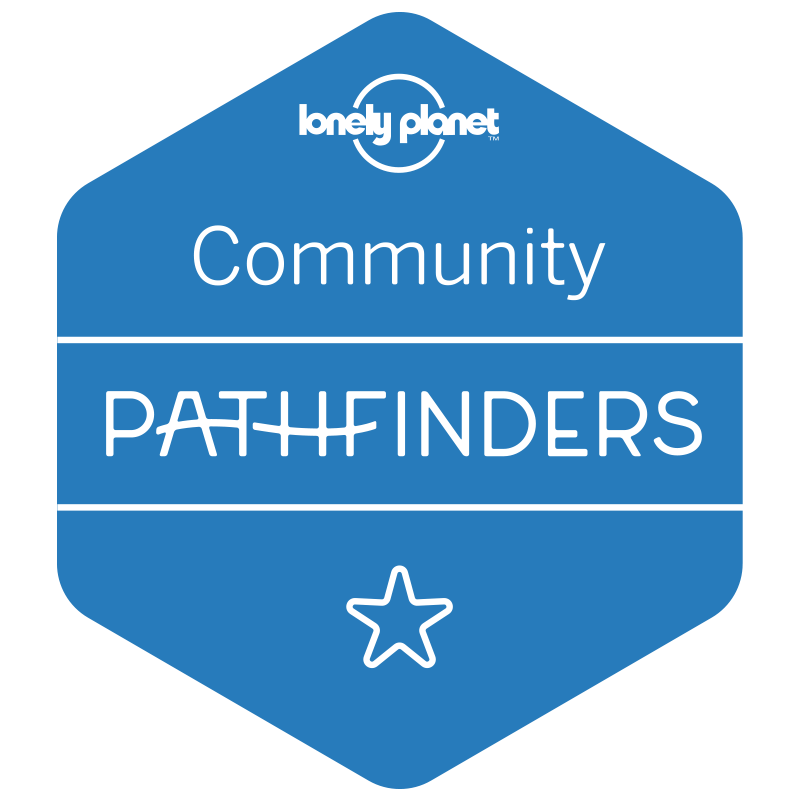 Have pinned to use when I finally get there! What a beautiful place! And your food pics are awesome! The views are stunning – you had me with the first picture from the cliff! Wouldn’t mind having a nice dinner and a glass of wine right there! Is the place as stunning as your photography skills? I have seen so many review posts but this one leaps ahead of others for the details and tidiness! I wish I could blog with the same skills. Parmigiana di melanzane looks delectable and I love the preparation of the dish. Though i’m not a foodie but love devouring a nice looking and well presented dish. What a beautiful place to amble around for it offers a lot of beautiful destination and have so much to do. I love how luxurious it looks, but the place is very serene and you can still commune with nature. I also love all your photos, it actually express the stunning beauty of this place. Thank you so much for sharing this with us. I was in Sorrento recently and you have certainly managed to capture the highlights in this post. I also loved the Parmigiana di melanzane. It was delicious. There is something special about eating it outdoors in Italy. Wow. I have not been to Sorrento but from what you have described, this is indeed one of the best places to go to. The pictures you have included on the food are mouth watering. Thank you for giving us this insightful information about Sorrento! I definitely go with your first reason on what makes this special – the views. Stunning in that first pic itself. I can imagine how it would be at every angle. And sunbathing? Those are like a lot of sun decks there. Do you have to book one to get one for yourself or is it readily available? So beautiful! 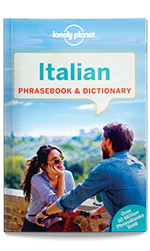 We visited Tuscany earlier in the year and I fell in love with Italy; having read this I think Sorrento is going to be high on our list of places to go when we return! The food, the setting…everything looks amazing in your pictures although I don’t know whether I could get on board with sunbathing on the wooden piers!! Ahhhh Sorrento! I was there just over 10 year ago as part of our honeymoon travelling around Italy. I’d forgotten about all of the lemons until I saw your photos! Such a beautiful place. Italy is probably at the top of countries I want to visit. It looks amazing. Sorrento looks beautiful, those views are stunning and the food sounds so good!